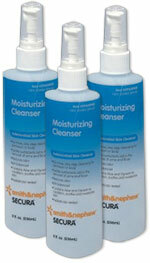 Smith and Nephew Secura Antimicrobial Cleanser 4oz Model 59430800 (Pack of 3) is a total body no rinse, one-step skin cleanser which emulsifies Zinc Oxide, stool and blood. It contains 0.13% benzethonium chloride to help reduce odor and is bactericidal. It is enriched with Aloe and Glycerin to help condition the skin. The pH-balanced formula protects the skin’s acid mantle and pediatrician tested. Smith and Nephew Secura Antimicrobial Cleanser 4oz is a total body no rinse, one-step skin cleanser which emulsifies Zinc Oxide, stool and blood. It contains 0.13% benzethonium chloride to help reduce odor and is bactericidal. It is enriched with Aloe and Glycerin to help condition the skin. The pH-balanced formula protects the skin's acid mantle and pediatrician tested. Pack of 3.